Snowmageddon 2014? 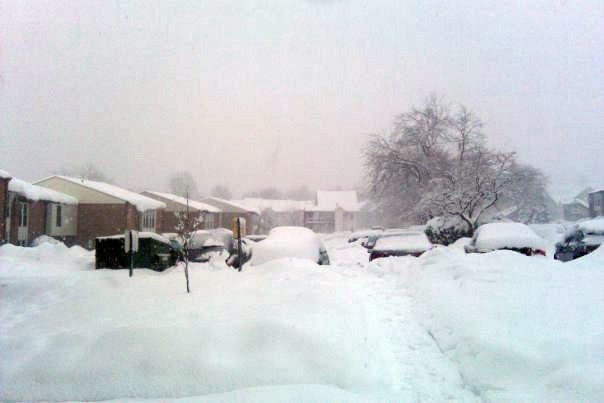 | Back Home Again: Snowmageddon 2014? One winter that we lived in PA, we got over 18 inches of snow three different times, two of which were within a week of each other. Down here in Southwest Indiana, we haven't gotten nearly the amount of snow as further north, only getting about 7 inches the day after my birthday and getting just a dusting from Winter Storm Hercules that came through yesterday. It's also been forecasted that we are to get four to eight inches Saturday night and on Sunday. However, since Southwest Indiana culturally identifies more with the south than with the Midwest like the rest of the state, it makes sense that this area does not have the capability to handle even a small amount of snow. I kid you not, the roads close and everyone freaks out when there's only a few inches. The road crews also do not pre-treat the roads nor do they plow until the snow has cleared (or at least it seems!). That dusting we got yesterday? Yeah, the roads were complete ice and no salt trucks to be found. You'd think that we would've seen at least one on our way to work, halfway across town from where we live (We actually did see one, but it was sitting on the side of the road at an accident). Having lived down here four years for undergrad and now three additional years with my family, it STILL blows my mind how backasswards this place is when it comes to winter weather. Four to eight inches of snow where I come from? Yeah, we'd probably get a school delay for day, maybe two. Down here? School is closed for almost a week! Ever since I was in college, I have always made fun of people down here because they have no clue how to drive in snow. And, I have always gotten so mad at Alan for freaking out about me driving in it. That changed during the last snowstorm though, when I spun across three lanes of traffic on the main highway through town and back then get stuck perpendicular to traffic because some idiot was flying down the road then cut me off and hit their brakes. Very, very scary. I was on my way home from work to pick up Cecily and that happened. If it hadn't have been for a good citizen behind me that stopped and helped push me out, I would've been stuck there til the snow melted. So, that is a long winded way of saying we decided to reschedule Ewan's birthday party for tomorrow because of the impending Snowmageddon 2014 coming to Evansville. Will we get that much or will it miss us? Who knows. But, I think I'd rather be safe than sorry this time! aw I'm sorry about the snow. it seems to be everywhere, if not that than freezing temps! I have to say I'm a little jealous of your snow. Here in southeast Arkansas we rarely see snow. If anything, we get ice. The last time it snowed here I wasn't married or had Jack. I stayed at my BFF's house with her family. She would put the kids to bed and we would have adult drinks and play the Wii. It was so much fun! We would stay up until the wee hours and have so much fun. I like snow usually. This time though my family is quite possibly going to be stuck in my house for a few extra days, which isn't good! I love snow normally, I'm just mad we had to reschedule Ewan's party at the last minute. Luckily everything worked out though. There will be details on the blog this week! It's so weird because the rest of Indiana is fine, it's just down here! Stopping by via SMS (: following via GFC and Pinterest. I can't imagine having winter without snow. Thanks for stopping by! And yes, I definitely miss having snow on the ground for the majority of winter.